A portrait of Dr. Donald Glendenning, Holland College’s founding president, was unveiled in the Florence Simmons Performance Hall recently. The portrait, by renowned artist Henry Purdy, was presented by the Association of Holland College Retirees to Dr. Don Glendenning to recognize the fiftieth anniversary of his appointment as president of Holland College. Mike Chapman, Vice President of the Association of Holland College Retirees, said the association wanted to recognize Dr. Glendenning’s fifty years of service to the college and to the retirees’ association. The unveiling ceremony included reminiscences from Fred Hyndman, who was a member of the Holland College Planning Committee, which interviewed candidates for the position of president, and Henry Purdy, who was one of the first instructors at the college. Current Holland College president Dr. Sandy MacDonald and Dr. Glendenning also spoke. Henry Purdy said he wanted the painting to reflect Dr. Glendenning’s character. “The significance of the portrait is in the significance of Dr. Glendenning, and the legacy that he has created for the college, our community, and our families. He set an example that changed the way we interacted with each other,” he said. Dr. Sandy MacDonald praised Dr. Glendenning’s efforts, noting that his accomplishments paved the way for subsequent college presidents. "Dr. Glendenning and a small staff started with 365 square feet of office space and a budget of $100,000. We have grown into a thriving institution of more than 2,400 full-time learners, over 600 adult education learners, and 700 EAL learners on Prince Edward Island, and approximately another 2,000 enrolled in Holland College programs in China. The college’s state-of-the-art infrastructure across our province is supported by a budget in excess of $65 million,” he said. Holland College will launch its fiftieth anniversary celebrations in September with a variety of events and activities across the province. More information will be available over the coming months. 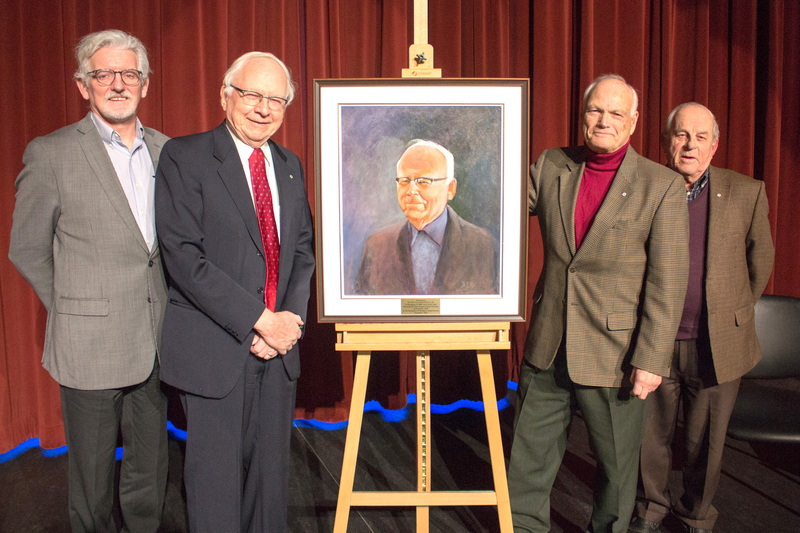 Holland College president Dr. Sandy MacDonald, founding president Dr. Donald Glendenning, artist and retired Holland College instructor Henry Purdy, and Fred Hyndman, who was a member of the Holland College Planning Committee, admire the portrait of Dr. Glendenning.